USS is the largest auctioning group in Japan, exhibiting more than 55,000 cars every week at more than 16 auction halls throughout Japan. HAA Kobe is the largest auction hall in the Kansai region. Honda auctions are made up of cars exhibited by Honda dealers and specialize in Honda brand cars. 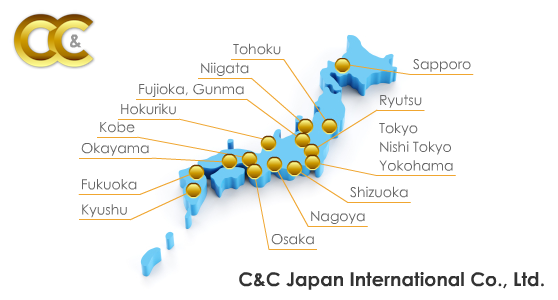 They hold auctions in Tokyo, Nagoya, Kobe, Fukuoka, Hokkaido and Sendai, and claim one of the highest sale rates in the industry. The Arai group is the third largest auction group in Japan with four auction halls located in the Kanto region (the area around Tokyo). This is an auction group managed by Toyota and handles mainly Toyota brand cars. It holds a total of six auctions throughout Japan. The JAA auction group has been maintaining the second highest number of exhibits in the Kanto region for over a decade, and averages 4,500 exhibits every Wednesday. The KCAA group hold three weekly auctions in Southern Japan. The LAA group hold two auctions every week, one in Hyogo prefecture, and the another on the island of Shikoku. With auctions in the three major cities of Tokyo, Nagoya, and Osaka, NAA auctions specialise in Nissan brand cars. SAA holds two weekly auctions, one in the city of Hamamatsu (where the headquarters of Suzuki is located), and the other on the northern island of Hokkaido. ZIP auctions, held in Tokyo and Osaka, specialise in imported foreign brand cars, which account for approximately 95% of all exhibits. AS-Net is an auction portal site connected to over 44 major auction halls throughout Japan. With AS-Net services, you are able to place bids on cars exhibited at any of the participating auction halls, even at auction halls where we may not be officially registered. Therefore more than 100,000 cars are available for bidding every week through the AS-Net. This is an auction held every Saturday to Monday on three consecutive days using satellite networks. There is no actual auction hall involved as cars are exhibited from all over Japan using satelite imagery. The average number of cars exhibited through Aucnet is approximately 7,000. Previously known as Osaka Nanko Auto Auction, Bayauc is the world's first internet-based automobile auction. It is held every Wednesday and averages over 3,000 exhibits weekly. Held in Saitama prefecture, BCN auction is held every Wednesday with an average of over 1,500 exhibits. IAA Osaka is held every Wednesday in the southern Osaka city of Izumi. Also held in Saitama prefecture on Wednesdays, HERO averages just over 1,000 exhibits weekly.